In April of 2011, Mandala received the sad news that Liberation Prison Project student, Robert Page, had taken his own life (obituary page 52 of July-Sept 2011). Robert was a talented musician and artist who studied with Liberation Prison Project during a ten year prison sentence and after his release five years ago. 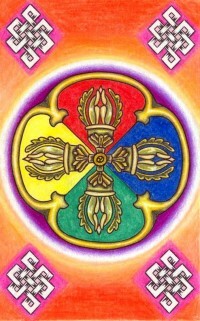 While incarcerated, Robert created this beautiful image of a double dorje and offered it to Liberation Prison Project. 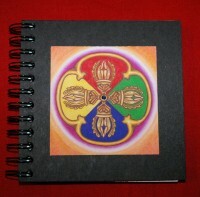 The image was used, as well as other prisoner art, for a series of journals and notebooks produced by Liberation Prison Project to raise funds for the project. View artwork offered to Liberation Prison Project by prisoner students.